Ladies and gentlemen, boys and girls, I finally did the impossible- I found the perfect leather do-it-all go anywhere handbag. I’ve been searching (and saving money) all summer for the perfect bag that has it all- style, a great color and room to fit my iPad. My number one choice for a new handbag addition to my closet is the classic Italian Leather Hammitt Brentwood bag ($585)- but it’s slightly out of my budget -and the boy would totally bust me if I had another Hammitt- so I had to start all over again and drool over something new. I’ve had a giant bag crush on the Michael Kors Jet Set Saffiano Travel Tote ($278) since St. Paddy’s day, but the simplicity of it is a little too simple, plus there’s nowhere to put all my gadgets and everything would get bundled up in that big bucket tote. A Kate Spade Catherine Street Pippa ($398) was also on my list, but for some reason the Vince Camuto Jennah Galaxy Leather Satchel ($258) ended up on top after just one visit to the local Nordstrom Rack. This awesome little bag has it all- a beautiful coral color, as well as high-quality stitching and the option to wear it multiple ways. The absolute best thing about this handbag is that it goes from work to glam with just two little buttons on the side. 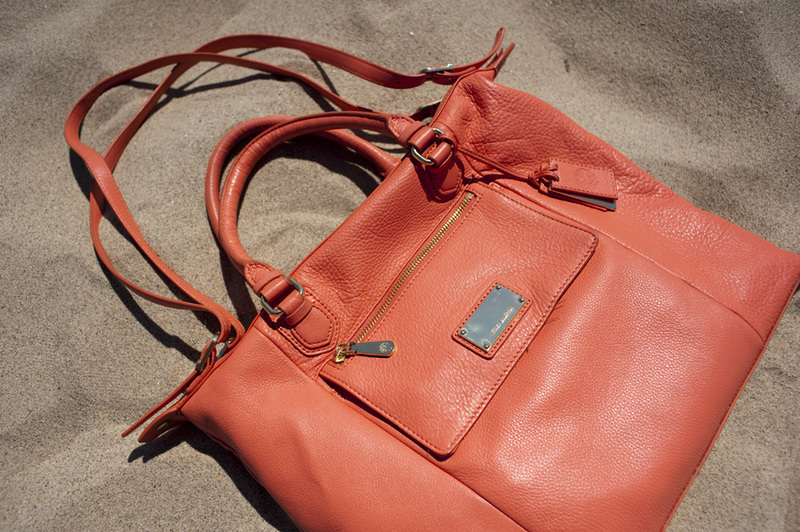 Button em up, and the bag is half it’s former size and the perfect crossbody or shoulder bag. How awesomely mulit-purpose is that?! There are also loads of places to stick everything imaginable. A bag with tons of pockets? Perfect! My next save up purchase? A leather jacket!